One of the longest living wildflowers, a mature White False Indigo plant practically jumps out of the ground in the spring, growing up to four feet in just a few days! Dazzling when in bloom, its white flowers are visible from quite a distance and the velvety, blue-green leaves are attractive all summer long. This butterfly attractor hosts many species of Butterflies. 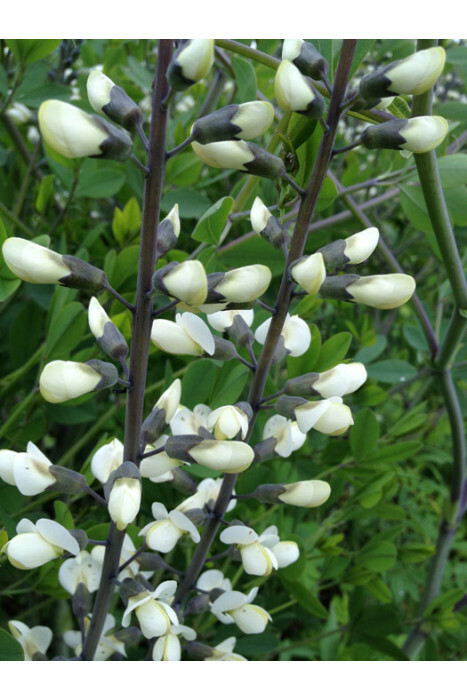 Baptisia alba has a very deep tap-root and does not transplant well once established. Indoors: Cold, moist stratification. Start at least 5 weeks before outdoor night temperatures are reliably in the 10 C (50 F) range. Mix the seed with a slightly moistened, sterile, soil-less growing mix. Put this in a labelled, sealed plastic bag and store in a refrigerator for one day. The next day place this in the freezer for one day. Repeat this for one week, alternating between the fridge and the freezer. After stratifying, plant seed 0.32 cm (1/8 inch) deep in pots. Keep moist but not soggy and very warm (21 C - 70 F). When seedlings are 5 cm (2 inches) tall or more, transplant into the garden spaced 30 cm (1 foot) apart. Outdoors: Plant seed 3 mm (1/8 inch) deep in a prepared seed bed in late fall so that the seed overwinters and germinates naturally in spring. Outdoors Alternative: In late fall through to mid-winter fill plastic pots with a slightly moistened, sterile, soil-less growing mix. Plant seed 3 mm (1/8 inch) deep in pots and label the pots. Place them outdoors in an area where they will experience the snow and cold of winter. The seed will germinate in the pots in spring as the weather warms up. Be sure to water the pots regularly in spring and once the plants are 5 cm (2 inches) tall, transplant them into your garden.